First off, Happy NewYear Everyone!! I can’t believe we have officially put another year in the books. Every time it comes to this point on the calendar I ask myself where did the year go. Although I was able to get a lot of objectives checked off, there always seems to be that undertone of “I should have done more”. It will soon be time to set my new resolutions – I never do it until a few weeks into the new year to give me time to ponder what my goals are really going to be. For now, I’ll simply pat myself on the back having just completed a decade of blogging. That’s right, today represents the start of the 11th year here on the ol’ blog. It will be a few more days before the end of year stats are ready to post, but we’ll touch more upon that proud accomplishment when that post comes out. For now, let’s ring in the new year with a new variety for my birding list. 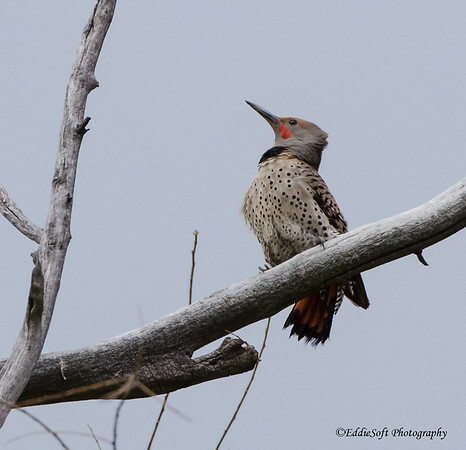 The Northern Flicker in itself is not a new check on my list having been featured back in March of 2016 (link here). If you look close at the pictures in that previous post, you will notice there is black line extending in from the bill. This represents one of the two subspecies of the Northern Flicker. Since it is black, it is easy to identify it as the “Black-Shafted” variety. I might have just fibbed, hit the jump for a correction! Sorry, I just deceived you. “Black-Shafted” is what I think this variety should be called, because … wait for it .. that is the color of the mark I look for in the field in order to distinguish the variety. Instead, they are called Yellow-shafted”. I understand they have the yellow under tails coloring, but generally this is the standard pose in tree or on the ground I spot them in (wings down). See the black ‘stache and immediately know what I am looking at. Contrast that with the specimen you see before you now found in Colorado back in May 2014. My apologies for those with color blindness with the reds, but this specimen has a red line on the side of the face. 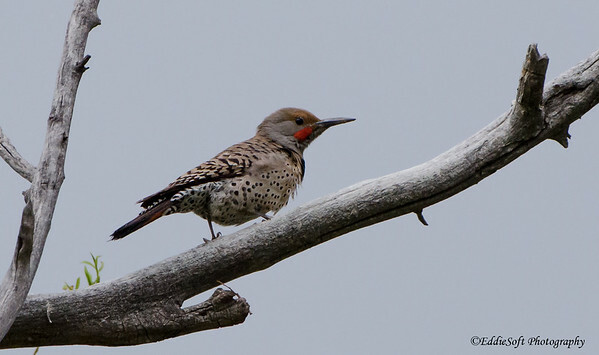 This represents the other species of the Flicker. Based on the slightly odd naming of the Yellow-Shafted, are you willing to take any guesses on the name of this subspecies? 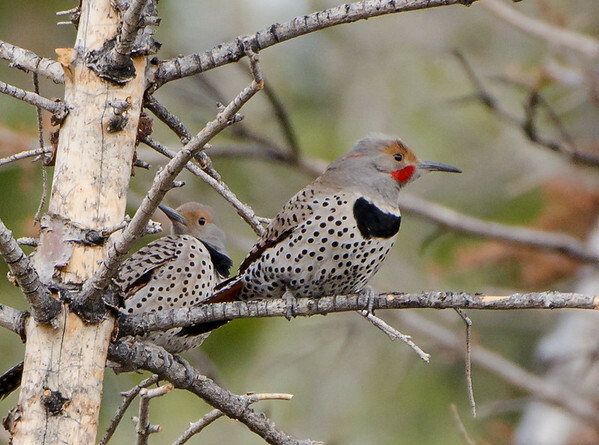 If you guess Purple-Shafted Northern Flicker you are correct. Wait, let me look that up again. I must have misread it originally, it is actually called Red-Shafted and yes, it does have the red coloring under the feathers. So, if you are keeping scores, the black crescent = “yellow” and red crescent = “red”. More importantly, this is a new species for me! Oh no, out of pictures. Let’s see what kinds of interesting facts I can leave you with. First off, not sure if I mentioned it, but the yellows are typically found in the East and the reds hang out mainly in the west. They are one of the few Woodpeckers that migrate with those living in the northern part packing up the RV and heading south – snowbirds ha! They used to be considered different species – bummer, could have padded my count. 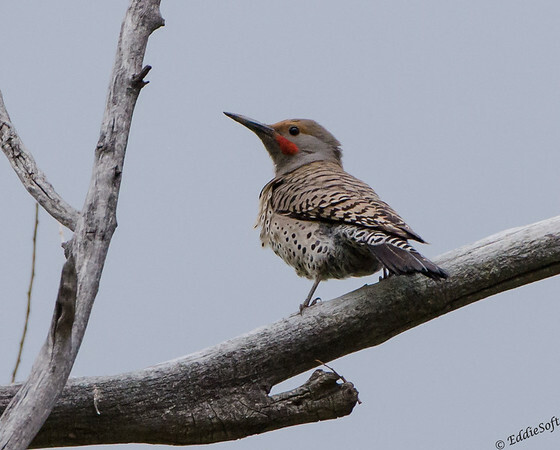 The Northern Flicker is the state bird of Alabama. I was surprised to find that this is the only state that has a Woodpecker for the state bird. Enough for today. Wanted to start the new year off right. I can’t wait to see what 2018 brings and as always, thanks for reading my musings last year and hope you continue while I discover even more things that intrigue me. Thank You! – I must say a very appropriate first name for my blog ha. I keep telling my brother if more people would accept my names for birds, my bird count would be a LOT higher. Appreciate you taking the time to comment. Hope you have a wonderful year ahead. I am now following you so I will hope to stay connected. I work full-time and don’t blog every night. Smiles sent your way! Welcome aboard my little vessel on the information superhighway – So far, the year is starting out pretty good – a little hectic.. but busy is good in my realm. My posting varies from month to month, but at a minimum there will be at least 6 posts a month per my self imposed quota – lately it has been a lot more thanks to some commitments I have coming up in March that required me to get through a lot of the Texas related posts. Hope you enjoy!